The husband and I awoke to yet another beautiful Costa Rican day and after a leisurely breakfast (fresh pineapple, mango, papaya and pancakes for me, gallo pinto for him, with laments about the hotel not serving tortillas for his rice-n-beans) we packed ourselves up and headed to La Fortuna waterfall. Catarata Fortuna, as it’s called in Spanish, is, according to Trip Advisor and a number of other tourist websites, one the most highly recommended stops in the area. We elected to hit it relatively early to avoid the crowds and arrived in the parking lot shortly after the gates opened. You read correctly. Gates. $15 per person is the fee to visit Catarata Fortuna. $15 for the honor of walking down 500 steps to the falls (which means 500 steps back up). It is a pretty waterfall. Some people were going into the large pool surrounding it, though we elected not to do so. I took photos. Fast shutter speed. Slow shutter speed. We sat for a few minutes, drinking it in. The husband said, “Huh. Snoqualmie is free.” I burst out laughing, because he made a very good point. 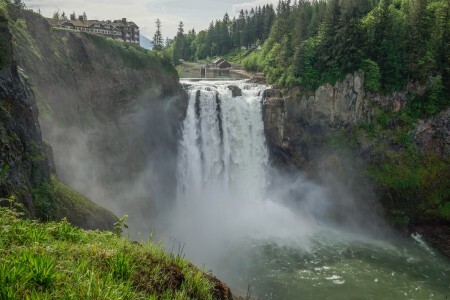 Snoqualmie Falls (not my photo). Perhaps if we were from an area that didn’t have a good number of waterfalls of varying sizes we would have been more impressed by Catarata than we were. But, when the majestic (and much larger…and free!) Snoqualmie Falls is just an hour and a half from home…well, Catarata Fortuna kinda starts looking like just another waterfall. We puffed out way back up the stairs, stopping to chug a large bottle of water at the top as we stood and sweated. And sweated. And sweated some more. Then we set off for our next destination: Arenal Volcano National Park or Parque Nacional Volcan Arenal. Yes, we moved on from Catarata that easily. $15!! Each!!! Can we pause for a moment and talk about names in Costa Rica? This is what I learned: most destinations have more than one name. Or, perhaps to be more precise, an Anglicized name and a Spanish name. But, sometimes the two are garbled together. I might find one name on a website, put that into the GPS and strike out, put in a partial possible name into the GPS and have it come up under a slightly different name, but in the same basic vicinity as I thought. Occasionally, I shrugged, muttered, “Hope this is right.” then would brightly state to the husband, “Turn left!” Why am I thinking of this now? Because we experienced that with both the waterfall and Volcano National Park. We arrived at the trail head in the park around 10 am, after dutifully paying $10/pp to get in. Are you sensing a theme? Takeaway: seems our favorite places (case in point: Mirador el Silencio) were also the cheapest. In fact, one could draw some conclusions, in hindsight, about how touristy a place was based upon how high the entrance fee. Hmmmm…. Our destination? The overlook (mirador) on the 1992 flow. We’d been told not to waste our time hiking the 1968 flow. So, off we went. The hike started in a different environment than we’d experienced thus far: tall, tall grass grew on either side of the dusty trail. The sun beat down. It was hot. And there appeared to be almost nothing to see. We started to sweat. I started to feel a snidge lightheaded, guzzled water and continued on, imagining how hot it was going to be once we hit the lava. Yes, that is an adorable, super-fluffy baby bird staring at you. We passed more people than we had seen our entire morning at el Silencio and wondered silently to ourselves if this one was worth it. Then, the trail split. To the right, signs for the Ceibo tree. Ahead, what appeared to be more of the same. We went right. And the jungle welcomed us into its fold. Birds chirped, frogs chirped (damn Blue Jean Frog…I can hear you! Why can’t I see you?) and lush greenness cast its net around us once again. I tried to convince the husband to swing from this vine Tarzan-style. He declined. After a bit, we found the ceibo tree. Why is specific attention given to this very large tree? Well, it’s 80 feet tall and thought to be about 200 years old. What’s a ceibo tree?Remember the Jurassic Park tree? You know the one I’m talking about. That’s a ceibo tree. Actually, we thought we’d found the big tree a couple of trees back, but it quickly became obvious that those had been mere babies when compared to the tree. We craned our necks back, mouths agape, took some photos and a video, then mosied on. We bit further down the trail we came upon a small family gathered around a large leaf on the edge of the tree and sidled up to see what they were looking at. “Snake!” they announced, pointing to a small, attractive snake curled up on the leaf. The meandered off and I stepped closer for photos, then stepped back and poked the husband, “Ahem. I believe that’s an eyelash pit viper.” Husband responded, “Poisonous, right?” “Yup,” I agreed. “You think that family had a clue?” he asked. “Nope,” I said. We both pondered that for a moment as we stared at the adorable poisonous little snake, then headed on down the path. We finally burst out of the jungle and climbed a short, semi-steep trail onto the lava flow. Bam! There was Mt. Arenal again (she was always following us around). In the distance we could see Lake Arenal. We paused for a few minutes, drinking in the view, enjoying a light breeze, and contemplating the sign that very sternly warned us not to traverse past it as we were standing in a highly volcanic area. Bellies growling, we set off at a swift clip down the straight shot trail (rather than going back through the jungle) and, in relative short order, were back at the car. Oh, wait, we saw a lizard in a tree on the way back. A very handsome lizard. The same family that spotted the snake was standing under the tree admiring him. Actually, it was the Mom who had spotted both snake and lizard. Good eyes. She probably spotted birds and that damn Blue Jean Frog, too. Back in La Fortuna we ate a forgettable lunch at the Lava Lounge (note: when in La Fortuna, don’t go to the Lava Lounge. Find a local soda that serves casado and eat there) and then returned to our bungalow for a swim and a lazy evening. Well, not completely lazy. I took myself on my very own night walk. A thunderstorm rolled in. Thunder, lightning, but no rain, so we moved to the front steps to get a better look as it rolled through the valley below us. The cicadas were yelling, the frogs were croaking, and I had an epiphany: why not take myself on my own night walk. I donned my head lamp, grabbed my camera and proceeded to walk around our bungalow. Success! Frogs. Lizard. Big giant moth. More frogs. Cicada. Peso. Yes, our little feline friend had returned. I shooed him off as the husband said he believed the cat had sat on our porch bawling to be let in the night before and I wanted to avoid a repeat of such behavior. I felt bad, but I don’t think Peso’s feelings were hurt as he continued to return after each shooeing, rubbing against my legs, trying to grab the frog I was photographing. I was shooting a cicada clinging to a small bush when Peso again returned, rubbing under the bush, unaware of the cicada until its legs tangled into his fur. Startled, Peso grabbed the cicada and just as quickly dropped it. Apparently cicadas don’t taste good. It was actually one of my favorite evenings. Thunder rumbling…lightening flashing…hunting critters to photograph…plopping down on the step next to the husband to sip red wine. Pura vida.